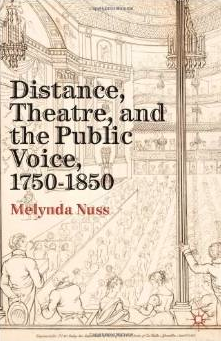 Now that I've brought out my upteenth book, I don't get too glittery-eyed about any of it; I just hope my books are there (they were, whew), the microphone works (it did, yay) and enough of the seats are filled that everyone feels it all worked out reasonably well (they were, thank you all). (2) meeting friends, new and old. These stunning images of one of the most sparsely populated and least visited regions of North America are not your typical coffee table book pretty pictures. 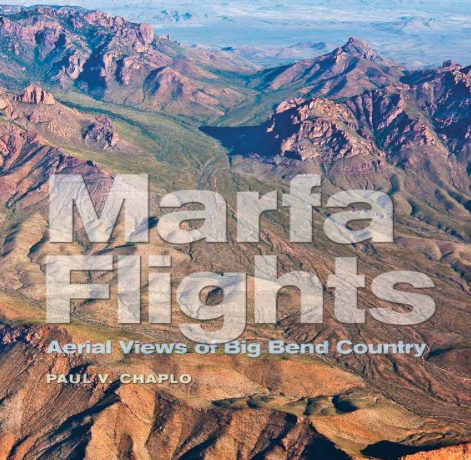 In Marfa Flights: Aerial Views of Big Bend Country, Paul V. Chaplo, a classically trained visual artist who also happens to be a professional photographer, found and composed out of this swirlingly violent and bone-dry landscape something wondrous and haunting. Photographed from a single engine airplane, at various times of day, the land and sky and jewel-like ribbons of water come alive with form, muscle, and color. (3) The Colorado River: which I'd seen before, but noticed anew. Early in the morning when I drove over the bridge into downtown, the water looked a jewel-olive, and it was filled with boaters. (4) Many people— people being an endless source of surprise to me— apparently find cowboy boots comfortable enough for trudging around on sidewalks. And some, going for the cowgirl-goes-nighty-night look, I guess, pair them with gauzy mini-skirts. (7) Synchronity alert! By alphabetic happenstance, Yours Truly and M. M. McAllen found our books stacked side-by-side in the book tent. 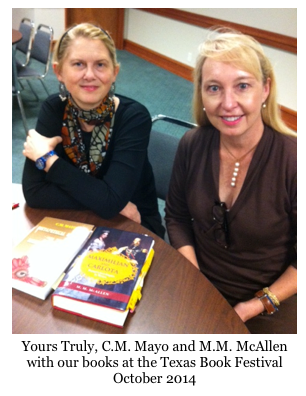 We read together for the panel "A Layered History," about Mexican history— McAllen on the Second Empire, and Yours Truly on the Mexican Revolution. Hey y'all go get M.M. 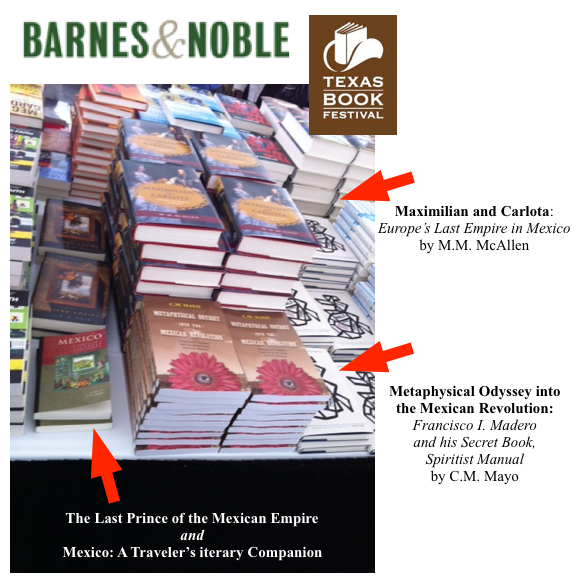 McAllen's book, Maximilian and Carlota: Europe's Last Empire in Mexico. It's the latest and best narrative history of the Second Empire, a fascinating translational period in Mexican history. Plus, this gorgeous hardcover edition makes a handsome holiday gift! 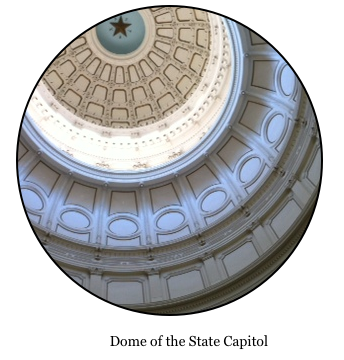 In case you haven't been reading this blog, in which case you'll just have to forgive yet one more mention, or else go away now and have a nice life, my book is the blast-your-sombrero-off rewrite of the Mexican Revolution, Metaphysical Odyssey into the Mexican Revolution: Francisco I. Madero and His Secret Book, Spiritist Manual. (8) Many Mexicans seem to nurture an intense flame of fascination with Maximilian's and Carlota's reproductive lives. I have yet to attend a talk about Maximilian, whether my own or someone else's, where one or more of the Mexican audience members doesn't ask about the supposed illegitimate children. And rare indeed when they don't also ask about Carlota's supposed offspring. 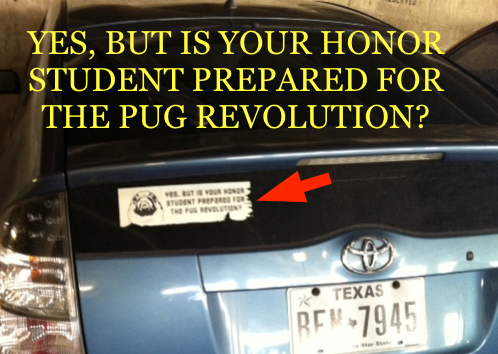 (11) If I lived in Austin, the first thing I would buy is a pair of Yeti oven mitts. It's that kind of vibe, yeah. "Over Burro Mesa / The Kickapoo Ambassadors"